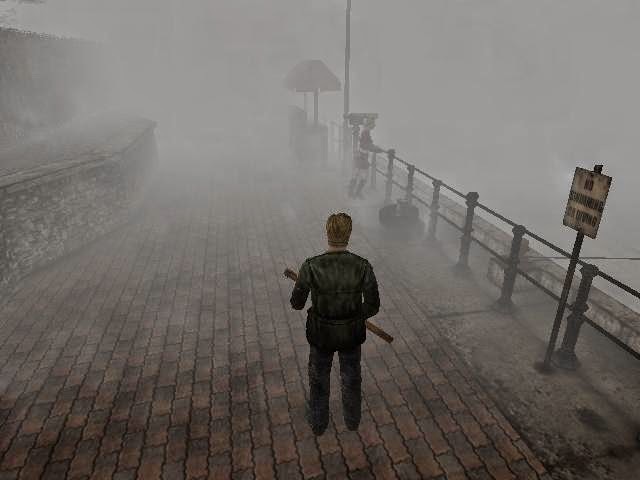 The first visual aspect that is most obvious when we first see the town of Silent Hill is the fog. 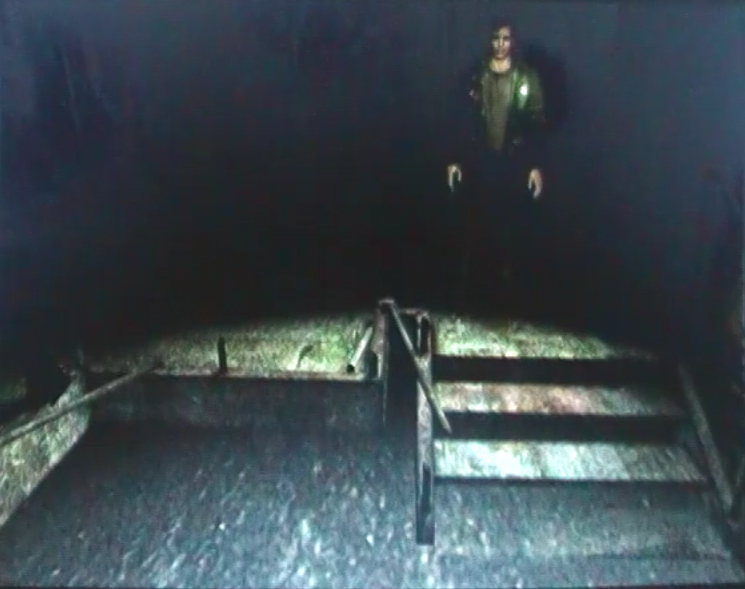 Born from a technical necessity in the first game of the series, the fog in Silent Hill 2 assumes a totally different importance – it tells us when James is lost in illusions. We can see that throughout the game the intensity of the fog is variable, sometimes only being present in the near distance and others so close that it becomes claustrophobic. The fog in certain scenes almost even covers the entire screen. Because of its volume and the way it interacts with objects in movement, the fog seems to be mixed with smoke. This could be an allusion to the fire that took place in the Lakeview Hotel. 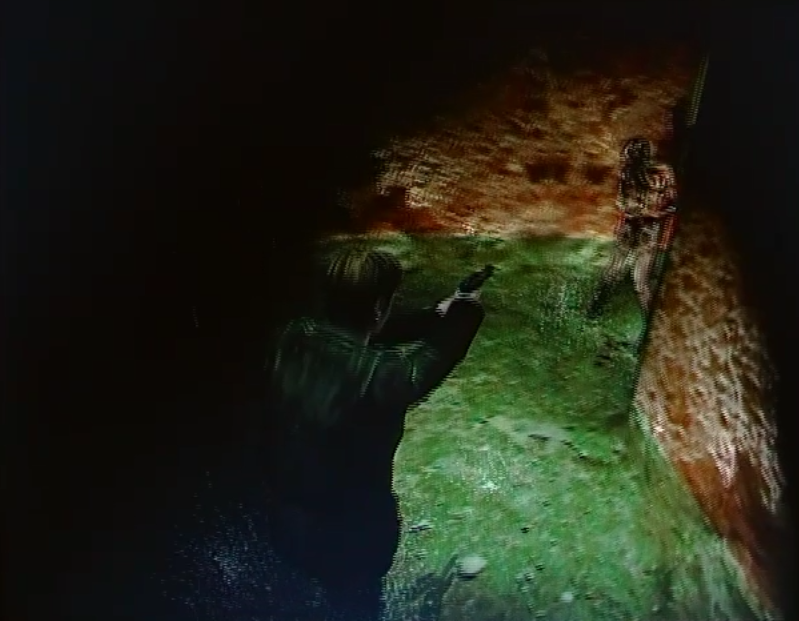 The other big element of the environment in SH2 is the darkness. Darkness being black and the fog being white / grey creates an automatic contrast between the two, that makes one ponder over the significance of these two natural elements. The fog and the darkness do share one thing is common that is both limit James’s field of view. 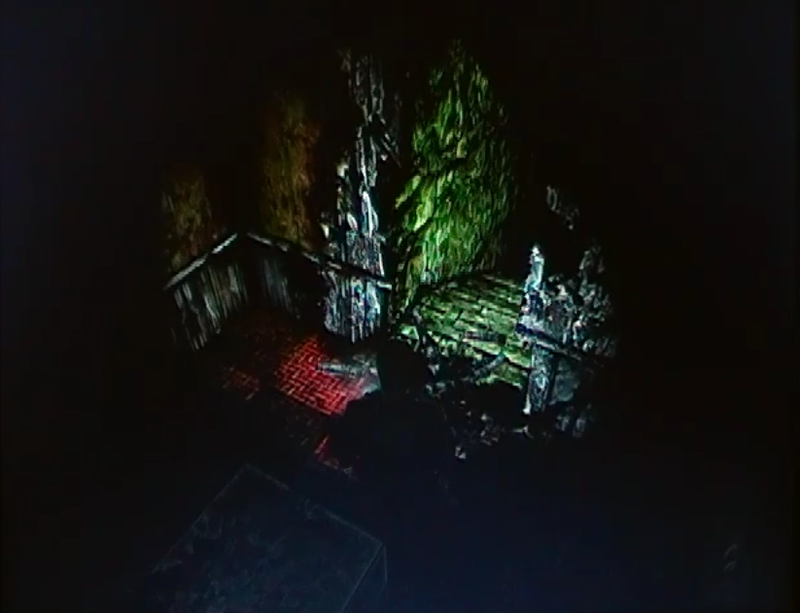 But it’s in the second act of SH2 that the environment really starts deforming itself. 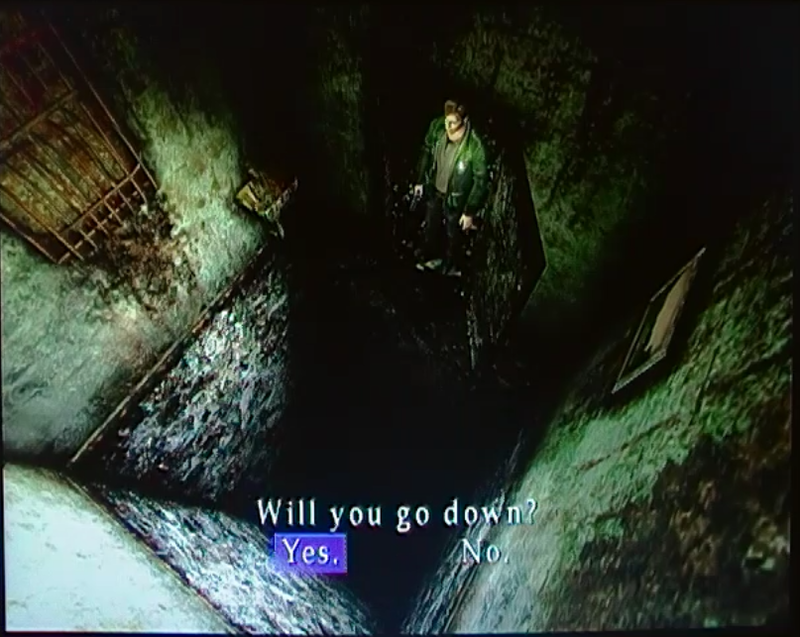 After entering in the Old Society of Silent Hill, James begins a descending journey that will make him explore his biggest traumas, desires and occult memories. But one could say that this journey starts much before the Old Society. It starts in the Hospital. 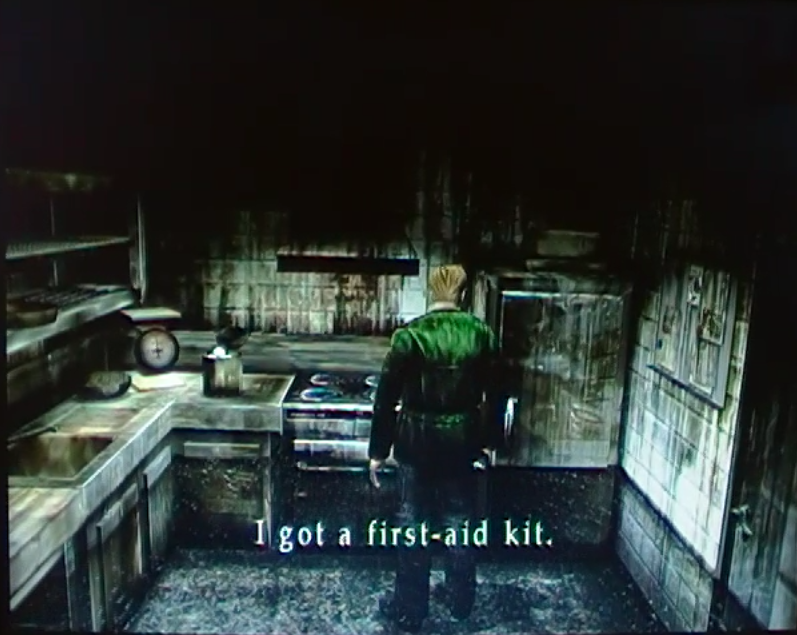 In order to leave the Brookhaven Hospital, James needs to find two rings and he must place them in the Lady of the Door, one in each indicator. Please, notice how the color of her rob is red. It’s only after that that the door opens. 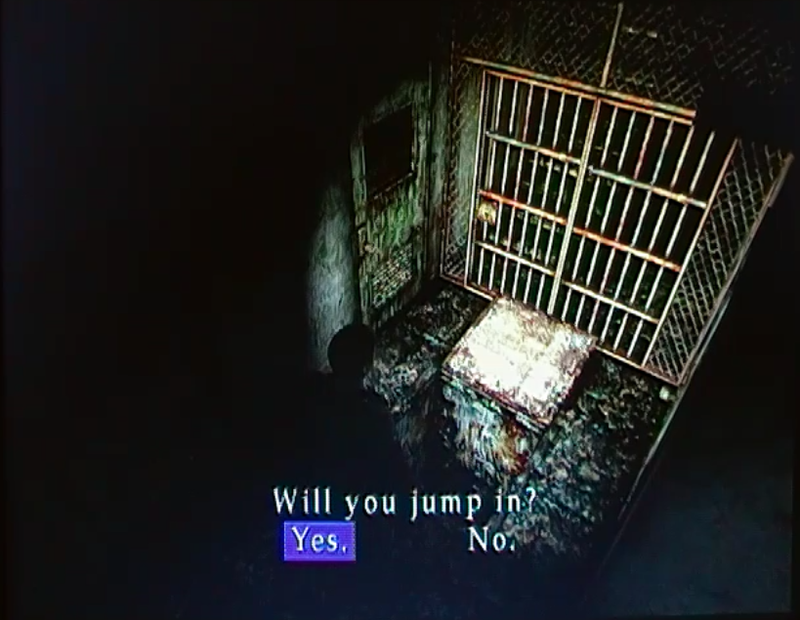 When James opens the door, he must go down the stairs until he reaches the area that previously belonged to the basement, but now there’s an extra pair of stairs that go out the layout of the building itself. 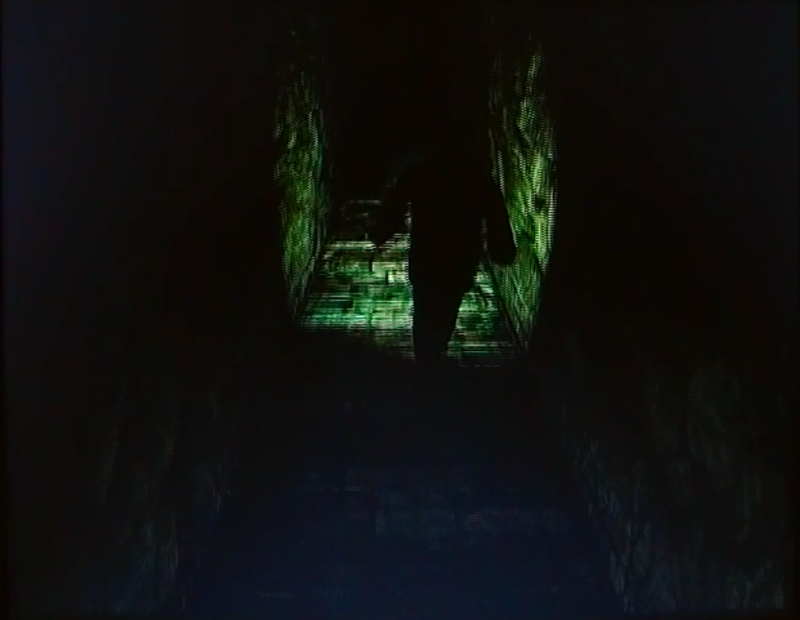 These stairs take the player into a sinuous corridor that leads into an elevator. This elevator never could take anyone back into the hospital because it is out of the boundaries of the building. 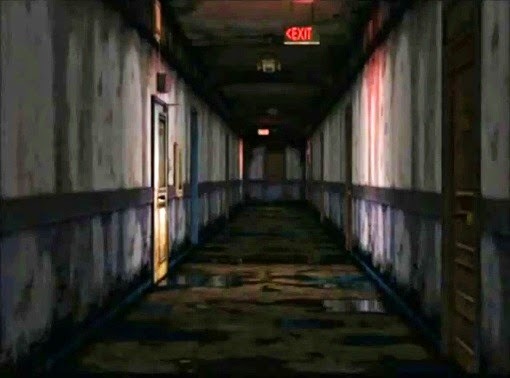 Nevertheless, this is precisely what happens, and James returns to the first floor. It’s for this reason important to notice that reality starts decaying and little by little we start to delve deeper into James’s mind. One could argue that the fragility of reality in which James is present is manifested in a more direct way, in the creatures called the Mandarins. These creatures move themselves by hanging over a dark abyss. In the Old Society, one of the walls has a massive hole and bricks are scattered around the floor. On the other side of the hole, there’s a ramp that descends into the depths of the earth. Notice that the floor is red. On the other side there’s a extension of the Old Society mixed with the Toluca Prison. 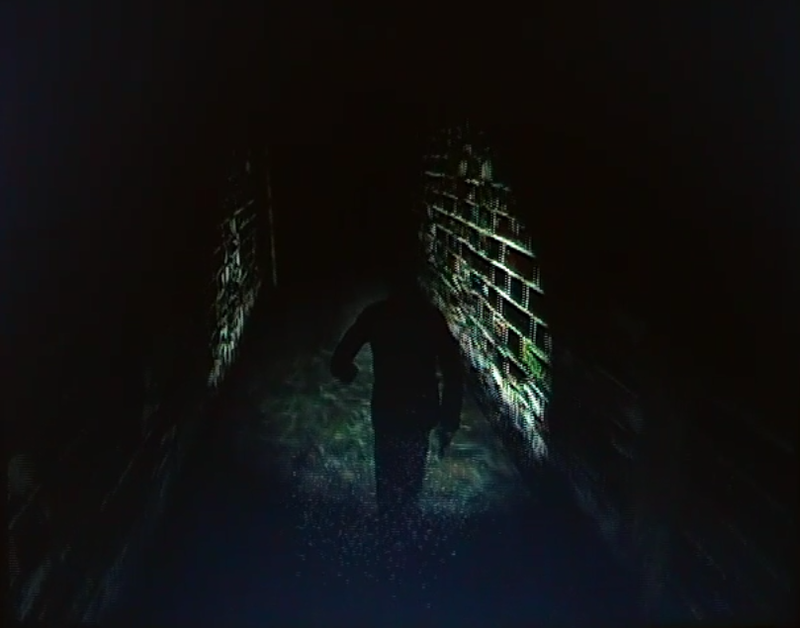 It’s in this area that the player finds one of the first holes in which James as to jump into. Then another one that is present in a inverted corridor. After jumping, the camera rotates so that it seems that James is being dragged rather than falling. 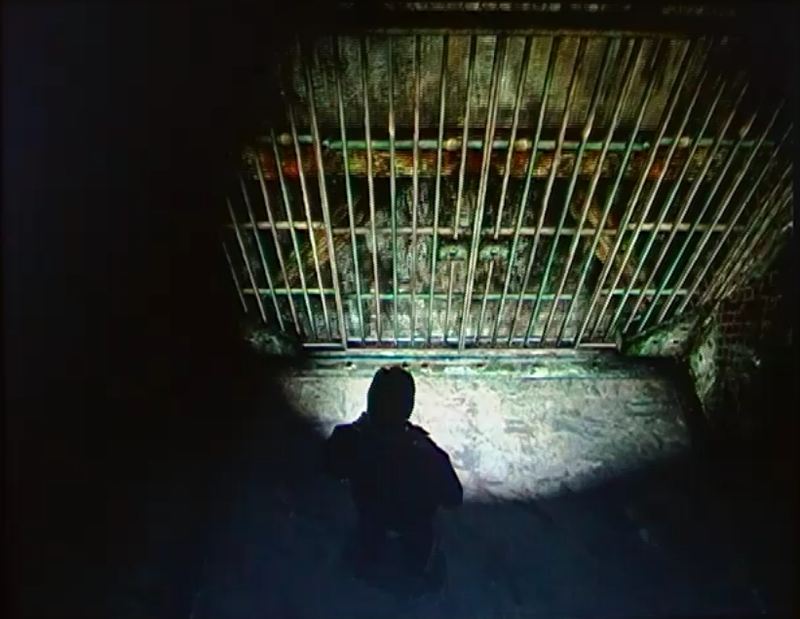 Then, already inside the prison, the player finds another hole in which to jump into. 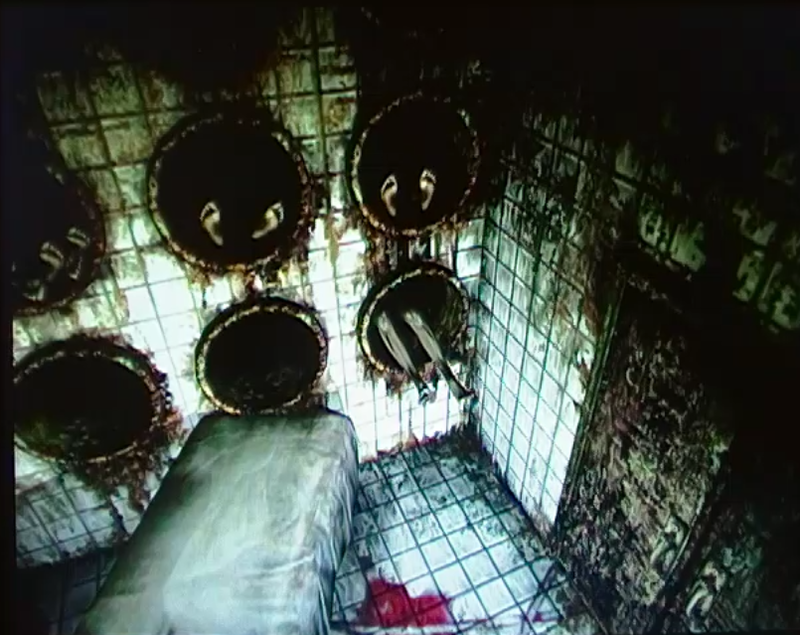 After that, in the morgue the player finds a series of cylindrical holes in the walls into which bodies where staked. 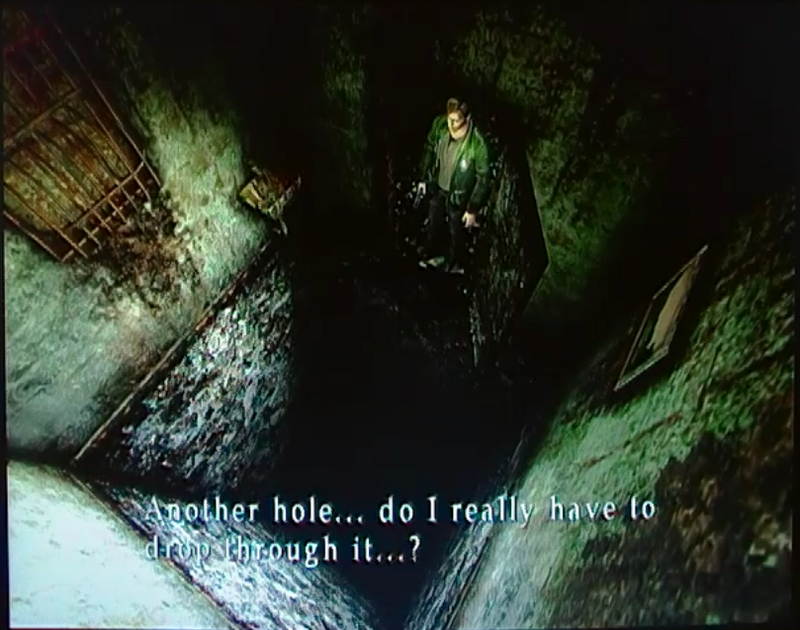 On the next room, a body is placed near a huge hole. There’s blood on the wall and James must jump down once again. 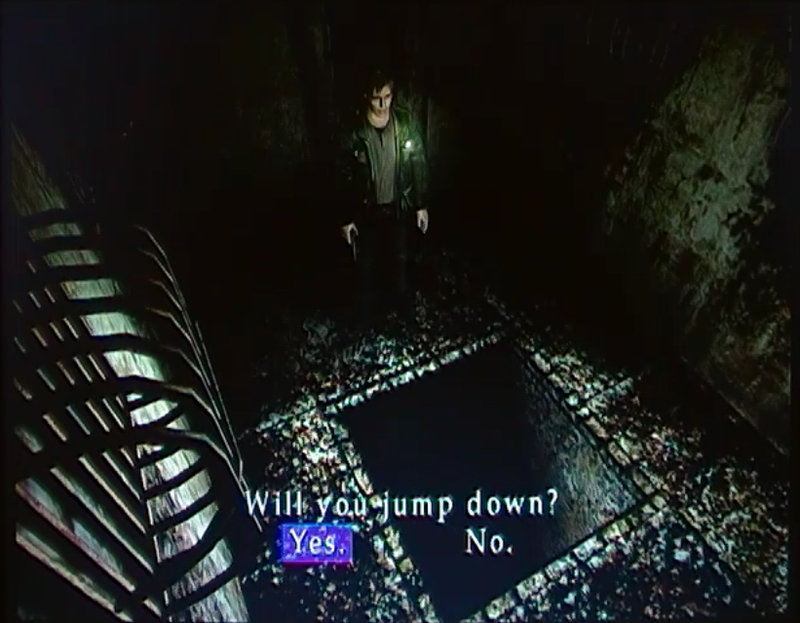 In the last hole into which James must jump, he even comments on the fact that there’s another hole and asks himself he really needs to do it. 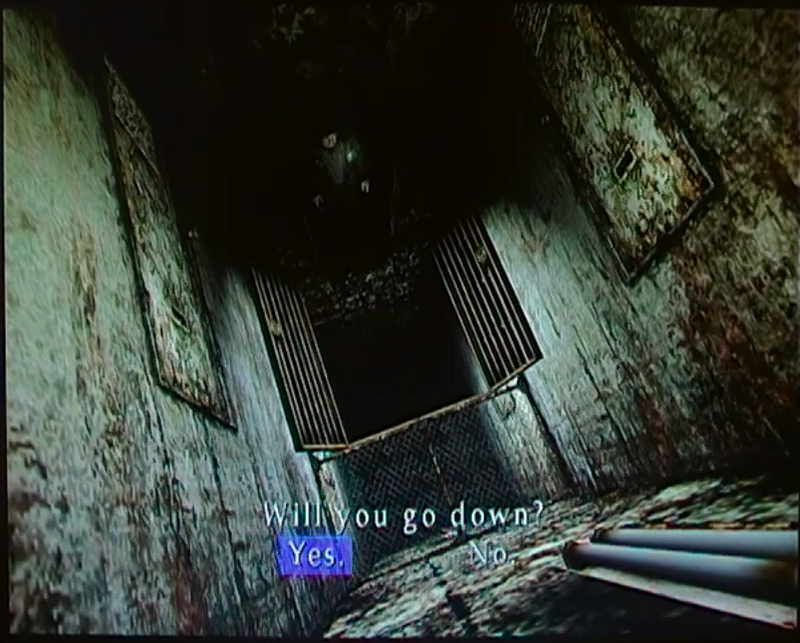 At this time, the player already doesn’t know where he himself is in a special relation to Silent Hill. And to finalize, an enormous elevator takes James deeper down. It’s to notice that it even takes a lot of time until we reach the bottom, emphasizing the ridiculous nature of it all. As said previously, the members of Team Silent committed themselves to the creation of this project and besides that they were ‘obsessed with details’. It is obvious that the inclusion of all these holes and illogical spaces isn’t just a way of making the player feel fear or confusion. It serves the purpose of making us question the reality of the situation itself. We aren’t actually descending in reality, but delving deeper into James’s mind. For this reason everything that happens in the Labyrinth as much more meaning than what it is normally believed to have. This will be discussed in the next chapters. 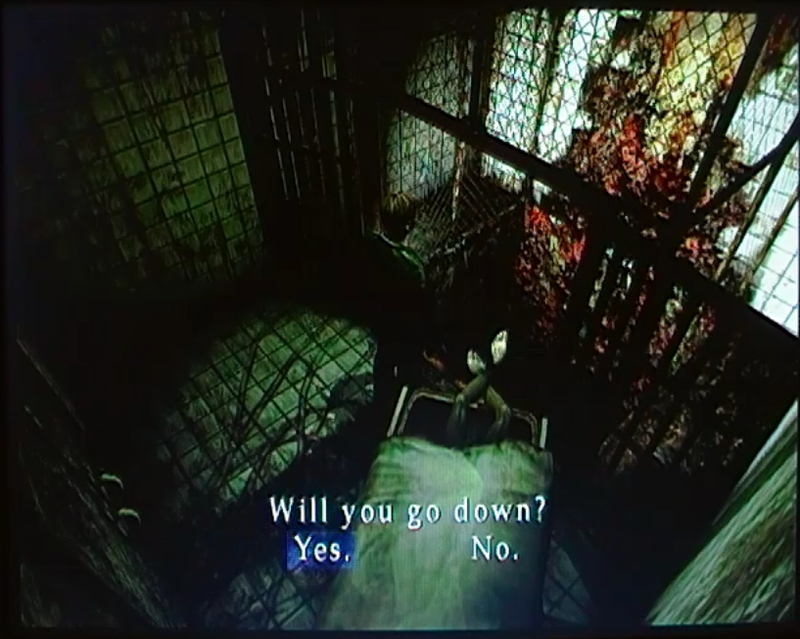 Before arriving at the Lakeview Hotel, the player must first travel by boat from the prison to the hotel. 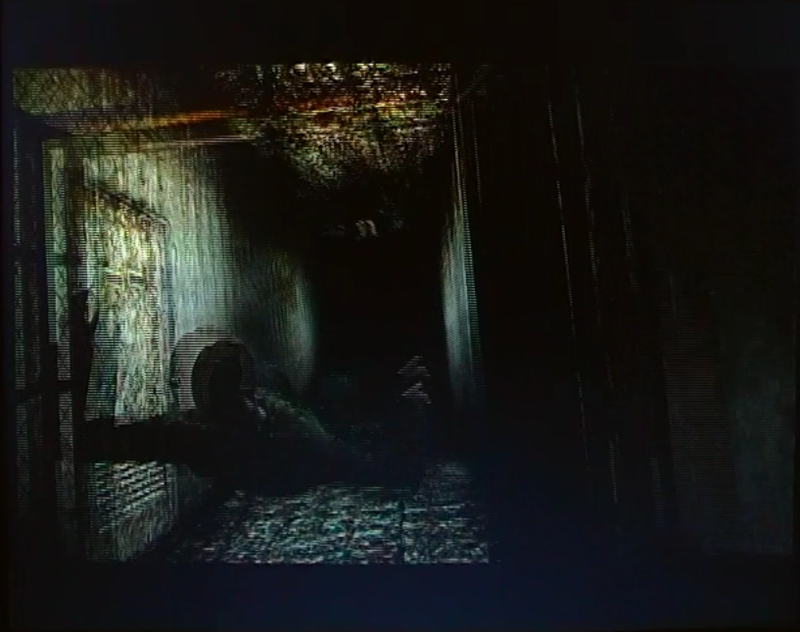 This sequence is reminiscent to that of the beginning of SH2 due to the amount of time it takes from one point of the map to the other. When we arrive at the Lakeview Hotel, it is in pristine conditions, like it was three years ago, when James and Mary were staying there. James comments on this fact with admiration. The interior of the hotel itself also is in immaculate condition and some rooms still have items that belonged to previous hosts. Nevertheless, this is an illusion that starts deteriorating itself little by little after James sees the videotape that he recorded with Mary. Another element frequently present in the environment is water. We can find water in all sort of strange places, like for example, the ground of the second floor of a block of apartments, the “weird” zone below the Old Society, the tunnels in the Labyrinth, the hotel and drips fall from the ceiling in the Toluca Prison. 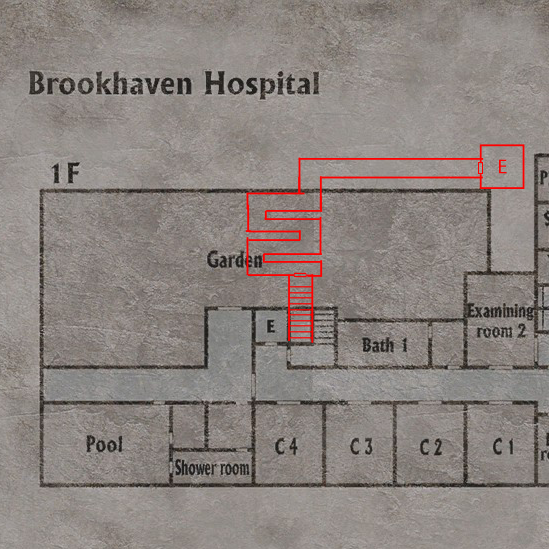 In the Brookhaven Hospital, when James is transported to the ‘otherworld’, we see that the floor, cealing and walls are covered with green moss, something that can only happen in places that are highly humid and wet. It is for certain that a hospital would be constructed in such a way that this sort of things would never happen, if this was a normal scenario. 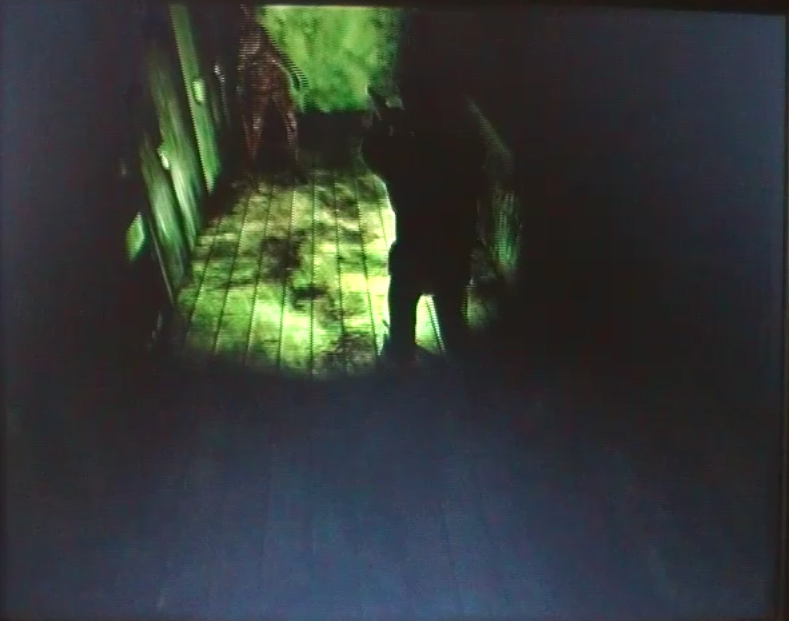 In the end of the first fight against Red Pyramid Thing, this one goes down the stairs which are filled with water making it slowly fade away. 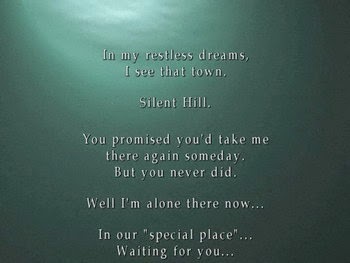 One of the first things that we see in Silent Hill is actually the Toluca Lake, when James is reflecting upon the mysterious letter he received from Mary. 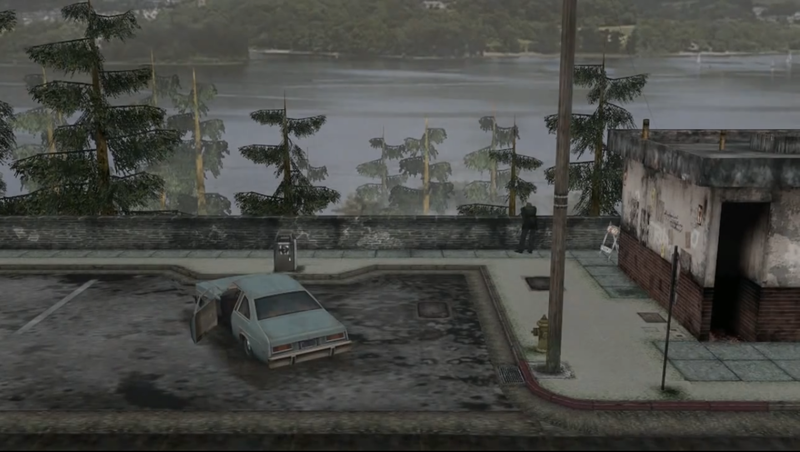 In one of the possible endings, it is given to our understanding that James commits suicide driving his car into the Toluca Lake. I am the Crimson One. You all know that I am One. Yes, and the One is I. 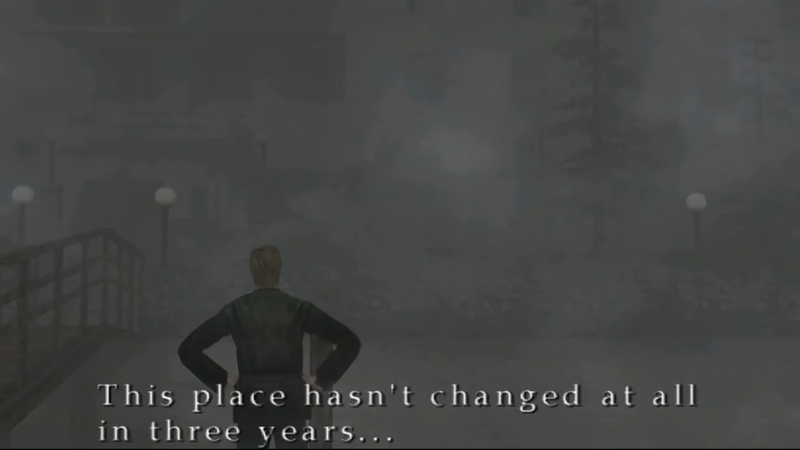 This changes our perspective upon the town of Silent Hill that we are often used to. It is often said that the town itself is what causes the manifestations and spatial anomalies to happen, but in all reality this doesn’t make much sense. What really happens is that this ancient god called Crimson is the responsible for everything paranormal that James sees. Notice again that Crimson is as color which is almost like the color red and, the book of the ceremony is actually red. This is not by chance but a clue to solve the mystery. 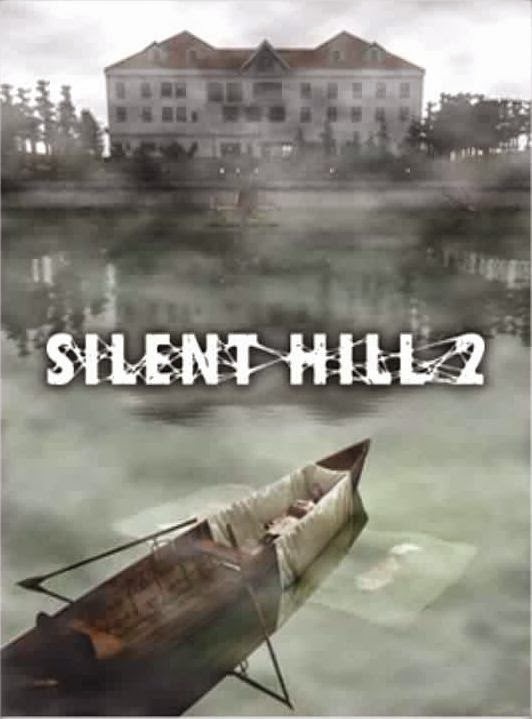 The color red is often associated with love and passion, but in Silent Hill 2 the color red is of another entire different importance, as we are going to find out in the next chapter.